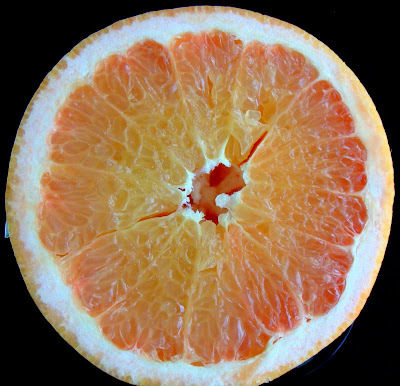 Among cirtus fruits, the grapefruit is probably many people's least favorite. Its bitter quality is an acquired taste, a taste which some people mask by sprinkling with sugar or drowning in honey. In terms of health, in particular antioxidants, this citrus fruit has many nutritional properties. An easy way to get around the bitterness, and to avoid loading up on unnecessary sugar calories, is to remove the white pith which surrounds the pulp. Of course, by eating it this way, much of the nutritious fiber is removed. 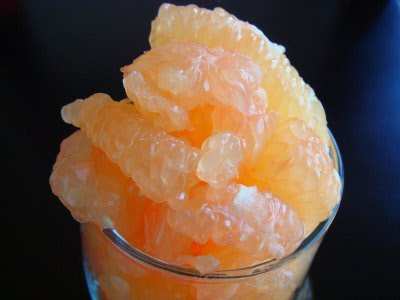 (With the pith, a grapefruit has six grams of your daily fiber requirement; without the pith, you still get about two grams. ) That is not to say that the pulp contains nothing nutritious. On the contrary. When it comes to vitamin C, grapefruit is almost on par with oranges. It packs an astounding 78% of our daily requirement. And we all know how important vitamin C is to our bodies. Besides boosting our immune system and preventing colds, this vitamin is an important antioxidant, helping to neutralize free radicals both inside and outside of our cells. As a result, grapefruit has been associated with preventing many inflammatory conditions, in particular asthma and rheumatoid arthritis. Vitamin C's antioxidant property has also been linked to a reduced of heart disease, stroke and cancer. Additionally, grapefruit is also high in lycopene, another antioxidant beneficial in the fight against cancer. Scientists have found an association between lycopene and the risk of colon cancer: a diet rich in lycopene has been shown to reduce men's risk of developing this form of cancer. Furthermore, it has been found that grapefruit and other citrus pulp contain compounds called glucarates may reduce the risk of breast cancer in women. So whether you choose to have it for breakfast or freshly squeezed as a drink, or even brulee- which I discovered recently- consider grapefruit as part of your plan for a healthy lifestyle. Schadt, David. "Just the grapefruit facts- health and nutritional benefits of grapefruit." "Grapefruit." The World's Healthiest Foods. http://www.whfoods.com/genpage.php? i'm almost convinced.....thinking about trying it now!